With that final statement, the main stage was quickly overcome with ocean-blue light just moments before Gambino unexpectedly popped up in the middle of the festival grounds. Surrounded by stark white lights that jutted all around him like daggers, the singer/rapper began his set with “Algorhythm” — the same hair-raising song that kicked off last year’s This Is America Tour. There is no joy in sorrow, no truth untold,” Gambino crooned as he slowly descended towards the stage. He then rushes into an intense rendition of “Riot” while the surrounding lights shine just as electric as the performance. 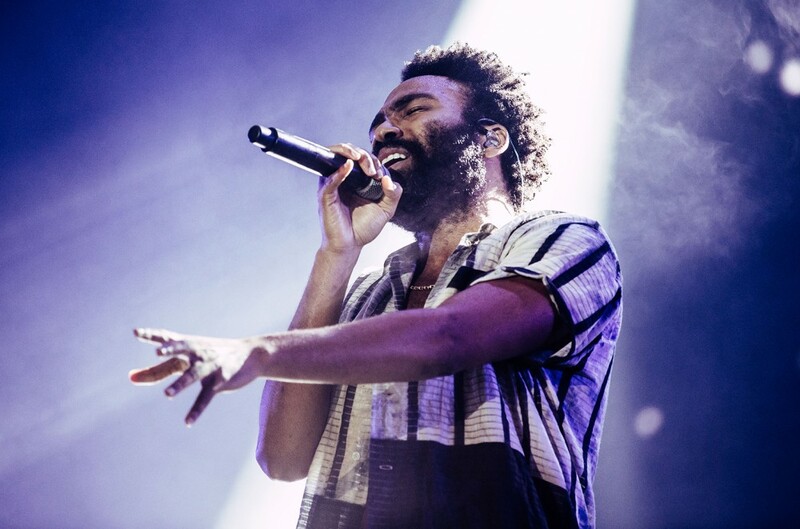 Following the premiere of his anticipated Guava Island mini-film prior to his headlining set, many fans were hoping that Gambino would also debut a new song to add on to the day’s excitement. The multi-hyphenate surely didn’t disappoint, dropping an electronic-based party-starter that fit right into the light-hearted vibes of last year’s Summer Pack EP. He later ended his set with — no surprise here — the record/song of the year "This Is America" and Awaken, My Love mainstay "Redbone."